In late 19th century cities, rivers and streams were conceptualized as something to be exploited, managed, and buried . During the industrialization and early urbanization era in the U.S., most streams were not only hidden but used to transport water waste, resulting in their ecological degradation [5, 17, 9, 15]. Burying streams has had negative environmental effects such as altering runoff patterns, changing the water quality and availability, decreasing natural habitats and increasing flooding and water pollution . In 1909 City Creek was entombed underground by the Salt Lake City Planning Division (SLCPD) to protect the water supply and prevent people from drowning . It was not until the U.S. environmental movement of the 1960s, particularly through the Clean Water Act, that public attention was given to restoring waterways and their ecosystems . The “daylighting” movement was popularized in the late 1970s in many U.S. cities . Daylighting is the practice of uncovering buried streams and restoring them to their natural state [10, 11]. The practice has a number of ecological benefits including increasing the ecosystem’s capacity to control storm water, flash floods and overflows, improving water quality, and reducing downstream erosion . A key scientific fact is that when floodplains are restored through daylighting, hydraulic storage is increased while reducing channelization . This means that water can be slowed down, helping to reduce the propensity of flash floods. Moreover, choke points where water backs up (e.g. culvets) are removed by restoring buried streams. In this way, daylighting is a cost effective alternative to having to maintain constantly the culvert and water flows in drainage systems . There are other ecological benefits of daylighting, such as improving biodiversity and the natural habitat by retaining nutrients for wildlife and plants . Besides environmental benefits, daylighting can provide social and economic benefits to communities such as increasing opportunities for recreation, entertainment, and economic development . Since the 1970s, recognition of the importance of daylighting streams has grown steadily. Today, there are many examples of daylighting projects globally including the Wadi Hanifa (Saudi Arabia) and Kallang River (Singapore), to mention a few. Probably one of the most recognized examples is in downtown Seoul, South Korea, where the Cheonggyecheon stream, buried under a freeway, was daylighted and restored in 2005 to become the main feature of a 5.79-kilometer linear park that attracts more than 60,000 visitors daily . An example of daylighting in the U.S. is the Muddy River Restoration Project in Brookline and Boston. After the Muddy River flooded in 1996, a number of stakeholders developed a multiphase and multiyear master plan valued at more than 90 million dollars to restore the river. The 2010 plan includes a 20-year flood risk management strategy that daylighted about 200 meters as well as created a shoreline park—invasive plants were removed and replaced with native wetland species, along with a number of other landscaping and habitat enhancements to improve water quality, reduce sedimentation, and cultivate a healthy environment for birds, amphibians, and a range of species. Similarly, the Saw Mill River in Yonkers was buried in the 1920s. In the 1990s it struggled with contamination due to industrial uses mostly of metals found in the water, illegal dumping, and sewage overflows when it flooded. The Brownfield Program from the EPA gave $250,000 to the city to daylight the river and improve its environmental, social, and economic conditions. This initial funding was leveraged into more funds (about $20 million by 2011), resulting in the restoration of water quality and aquatic habitat. In addition, trees and other vegetation were planted along the stream making the Saw Mill River the centerpiece for outdoor activities such as environmentally conscious workshops and a number of community events. Housing and commercial development has been built next to the river and this has revitalized the disinvested downtown area. 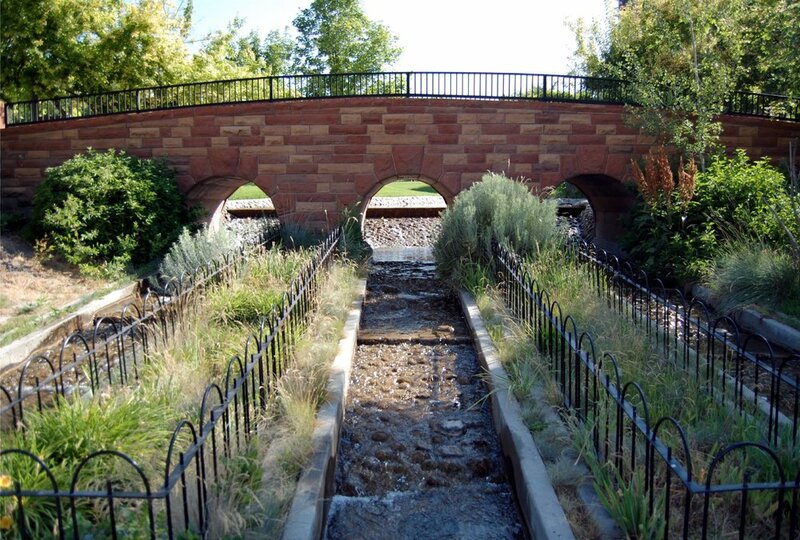 In Salt Lake City after a massive flooding in 1983 of the underground culvert into city streets, the SLCPD proactively adopted in their new Master Plan the strategy of daylighting City Creek to not only mitigate flooding, but also to improve water quality, reduce the urban heat island effect, provide a habitat for fish, birds, and other species as well as provide the public with access to nature. Today, there are two examples of daylighting in the city: 1) City Creek Park where one section of the creek was uncovered in 1995 and, 2) City Creek Center where the creek was daylighted as part of a new shopping mall built in 2012. Since then the SLCPD and a number of organizations, most notably the Seven Canyons Trust, have been pushing to daylight meters and meters of buried creeks in the Salt Lake Valley. Brian Tonetti, executive director of the Seven Canyons Trust expressed, “The Trust, works to daylight and rehabilitate the seven canyon creeks of Utah’s Wasatch Range, restoring beauty and health to the hydrology of the Salt Lake valley.” According to research by the Trust, over 34 kilometers of Salt Lake County’s seven main tributaries to the Jordan River are buried in underground culverts . This article specifically discusses a future trail and creek corridor that will daylight the creek in Euclid, an industrial and low income neighborhood with several Environmental Protection Agency (EPA) Brownfield sites. The creek is under former railroad tracks which makes it ideal to provide access to pedestrians and bicyclists in a 2.41-kilometer trail between the Jordan River and the central business district. Salt Lake City has recently allocated $450,000 for this particular stretch and an initial phase will be finished within the next two to three years. This article uses documents, interviews, and community surveys to understand how: 1) An industrial low income neighborhood (Euclid) became disconnected environmentally and economically from the rest of the city and which planning efforts had taken place or are planned to ameliorate some of these issues, 2) The Folsom Trail Daylighting Project will encourage sustainable development in the area and, 3) Community engagement through an event and creative placemaking served to raise awareness, build support for future enhancements, and assess residents’ priorities. Euclid is located about 3 kilometers west of downtown Salt Lake City and about 10 kilometers from the international airport. The area initially found difficulties in developing due to its alkaline drainage, poor soil, and frequent flooding from the Jordan River. This neighborhood was established in the late 1800s primarily to accommodate for industrial activities. As soon as industrial uses began to congregate along the western edge of downtown, it became apparent to developers that this neighborhood would one day become the center of industrial activities where workers would likely want to live. It was under these circumstances that City Creek was buried underground by the SLCPD. Homes for the working class were developed adjacent to the industrial development where lower income populations lived. With U.S. deindustrialization in the 1980s and 1990s, this neighborhood became more disinvested. Today, land uses include single and multi-family residential homes as well as a number of fast-food restaurants and motels along the eastern and southern edges bordering the elevated interstate highways. The Euclid Small Area Master Plan (SAMP) was initiated by the EPA. The EPA approved a grant in 2004 that was intended to assist in the restoration of City Creek, which goes through the heart of Euclid. The neighborhood was to be developed through several planned projects. For instance, there was bound to be development of a light rail transit line (named TRAX) extending from downtown to the International Airport. This light rail extension was finished in 2013 and now serves the existing Euclid residents while helping to attract new neighbors and businesses, which has the potential to transform the area into a mixed-use neighborhood in the foreseeable future. These public works were also expected to go a long way to stimulate the development of Euclid. The general idea is to transition some of the more intensive industrial uses to transit-oriented development. Before the initiation of these development projects, Euclid neighborhood residents, as well as property owners, were very concerned about the way their neighborhood was perceived. Vacant as well as poorly maintained homes and commercial buildings were targets of vandalism, trespassing, theft, and graffiti. The neighborhood was considered by the media and others as insecure and dilapidated, and there were regular reports about storage of trash as well as unlicensed vehicles. Although some of these conditions persist, the neighborhood has been improving because of new investment. There is a strong general desire for improving the neighborhood. The purpose of the Euclid SAMP was to define the structure of the neighborhood and equally design the character as well as outline guidelines and principles for directing future developments within the community. Some of the funds were directed to revitalize homes and commercial spaces surrounding the creek. The grant also allocated funds for community outreach for the City Creek daylighting project dubbed, “The Folsom Trail,” which will be discussed below. The Folsom Trail used to be a rail right-of-way and it is surrounded by industrial uses along with residential and commercial development. There are a number of EPA brownfield properties along the trail as well as a number of EPA Superfund properties such as the Utah Power & Light/American Barrel Company. Hazardous substances in the land and groundwater have detrimental health effects to people and wildlife in the neighborhood. Moreover, the lack of use and eyes on the street have made the trail susceptible to vandalism, crime, drug abuse, and homeless encampments—making it feel unsafe to neighbors. In response to a flood that took place in 1983, City Creek was buried along the Folsom Trail. A number of redevelopment studies have been completed—most notably, the Euclid Small Area Master Plan (2004) and North Temple Boulevards Plan (2010)—to diagnose the possibility of creating a trail along the rail right-of-away as well as uncover City Creek. Even though these plans were created/adopted and community outreach had taken place, the city had not earmarked funds for the project until fairly recently. In 2015, the Salt Lake City Transportation Division received $100,000 of Capital Improvement Projects to begin the design and development of a paved and multi-use trail along the Folsom rail right-of-way. In 2016, the Redevelopment Agency (RDA) of Salt Lake City requested funding to further assist with the design and development of the trail. Moreover, the City Council dedicated $350,000 of Parks Impact Fees to the project. In addition, in 2016, Utah Transit Authority included the Folsom Trail Plan in a federal grant application that was funded for $2.2 million. After many years of inactivity, construction is scheduled to begin in two to three years. Given this new momentum, the Westside Studio (a planning course at the University of Utah) engaged with stakeholders including Seven Canyons Trust, Salt Lake City Transportation, Restore North Temple and the RDA to begin community engagement efforts. On April 22, 2017 (Earth Day) Westside Studio conducted community outreach with the aforementioned stakeholders to obtain input on the future Folsom Trail. Residents provided their input on various topics such as daylighting City Creek, trail recommendations, possible amenities, and development priorities. This study employed qualitative and quantitative methods to assess the knowledge and support of the community for daylighting efforts as well as other elements that neighbors would like to see in a plan breaking ground next year. Students of the 2016 Westside Studio collected surveys from 292 residents on the west side of Salt Lake City. These surveys demonstrated the importance of conducting community outreach; thus, the course decided to hold an event for these purposes the following year. In 2017 Westside Studio students and faculty conducted about 15 short interviews with major stakeholders and residents to get their reactions of the proposed project and also learn from their expertise and experiences. These interviews were conducted before and during a community engagement event that students organized on Earth Day (April 22, 2017). Some of these quotes were typed and included in this manuscript to bring the voices of various stakeholders. In addition, students collected a total of 54 surveys the day of the event. The course conducted other community engagement techniques including dot voting and chalkboard visioning discussed below. The main goal of the event and community engagement efforts was to obtain an overall view of the resident perceptions about the daylighting of city creek and the creation of the Folsom Trail in the Euclid Neighborhood. The ideas of participants are being considered by planners and other managers into the final plan and eventually implementation of phase I, which is expected to break ground next year and continue during the next two to five years. In 2017 Westside Studio organized a community event where they invited the community to inform them about the Folsom Trail Plan, give their input of what they would like to see in the linear park, as well as tell people about the idea of uncovering the creek. The ideas generated by this community engagement process will be used by stakeholders’ organizations in the near future. According to the 292 surveys conducted by Westside Studio in 2016 a total of 60.2% of respondents did not know that City Creek is buried underneath the neighborhood. The survey also asked residents if they would you support daylighting City Creek in the future. The results were more mixed: 49.9% said “yes”, 9.6% said “no,” 37% said “maybe” and the rest selected “other.” Given that so many people did not know about the creek the task of Westside Studio in 2017 was to inform residents about it as well as inform them about the benefits of daylighting and documenting what they would like to see in the Folsom Trail. In 2017 the studio gathered community feedback using four main activities discussed below on an Earth Day event. A total of 54 surveys were collected. The survey consisted of eight questions. Three of these questions are highlighted below. Plan Knowledge – About 46% of respondents did not know about the plan before visiting the event. Folsom Trail – When participants were asked how they would use the Folsom Trail with the river as a center piece they had many answers such as biking, walking, jogging, hiking for exercise, recreation, shopping and commuting to work. People also thought that it would help them to connect with Downtown or to the Jordan River Parkway Trail. Many would also use the space to gather with their friends, family, and children, walk their dog, have a picnic, just relax or enjoy nature and water. Daylighting – Respondents had opinions about daylighting City Creek including that it will help to beautify and clean up the area, improve water quality and connect people to underground water sources and nature. Most talked about possible ecological benefits such as attracting wildlife, help with the heat-island effect, with flooding, and landscaping. Others were looking forward to increasing property values, business activity, and the number of visitors, as well as improving the general image of the area making it more inviting, safe, and less appealing to criminal activity. Many commented on how it could become a community amenity, a nice place to meet neighbors, a place to fish, engage in water play or other recreational activities, maybe a good green space for kids or to conduct community events. Some people mentioned that access to water brings about a variety of human psychological and physical health benefits, including numerous outdoor recreational activities. Others mentioned that it would help the neighborhood become more aware of the wild natural surroundings and educate people on preserving our waterways. Community residents were asked to use sticky colored dots to prioritize by order of importance the following issues: safety, connection to downtown, community space, exercise/ recreation, water quality and kid- friendly amenities. Each person was given 6 dots. Not surprisingly in a low income and disinvested neighborhood, most people prioritized safety, followed by water quality and community space. A chalkboard with the question, “What do you want to see here?” allowed residents to write down whatever they wanted. Some of the responses included: a trail with City Creek daylighted, water features, a safe place to walk with more lighting, a bike path and service stations, a dog park, benches, picnic tables, water fountains for humans and dogs, landscaping, shade trees, a community garden and active recreation facilities. A temporary installation of bilingual Spanish and English signage on North Temple Street and the Folsom Trail brought attention to where the creek and the trail will be. The signs were placed in different places around the Euclid neighborhood and they had different messages. For example: “With the Folsom Trail, it would be a 3-minute bike ride to the Jordan River Parkway” or “It is a 3-minute bike ride to the Folsom Trail Head.” These wayfinding signs included a QR code where people could find more information and fill out a survey if they were not able to attend the event on April 22nd. “We’ve been working on this project for nearly two decades, and we are ecstatic that we are beginning planning and design, and that construction is actually happening in the coming years! The Folsom Trail will provide a comfortable and safe link between west side neighborhoods, and employment and services Downtown and with this trail being so closed to the North Temple Corridor, this project brings us one step closer to branding North Temple a grand boulevard once again. The team really hopes that the Folsom Trail will provide a fun, healthy, and safe connection between west side neighborhoods and downtown, as well as connect people to water and nature for generations to come. Daylighting creeks as a practice hopefully will help change the paradigm of water streams being "on the way of urbanization" to water streams "as important environmental, social and economic community assets." The Folsom Corridor is currently an industrial site within the Euclid Neighborhood, an urbanized area that is currently polluted and attracts unwanted land uses and activities. In the near future stakeholders seek to activate the space by restoring and daylighting City Creek—improving water quality, access to nature, and becoming a community amenity in the underserved Euclid Neighborhood. The restoration of the creek will provide a number of environmental benefits. For example, the new riparian vegetation will create a vital habitat for migratory birds coming to the area. In addition, daylighting will be able to reduce the likelihood of flash flooding and polluted runoff. This particular daylighting project would be approximately 2.41 kilometers in an open channel of about one meter deep and three meters wide with a slope of about one-meter horizontal to one-third of a meter vertical. Once implemented, monitoring efforts will be needed to generate scientific data on the effect of daylighting reducing flashfloods and improving the habitat. Another environmental goal of the project is to provide a healthier environment for people as the space is transformed from a contaminated site into a clean urban green space that increases not only wellbeing, but livability. Moreover, the project will attract much needed development. The Folsom Trail and daylighting of City Creek will create a much needed connection between west side neighborhoods to downtown Salt Lake City. Euclid has long been cut off from the rest of the city by railroad tracks, freeways, and unwanted land uses. By uncovering City Creek, the health of the community will be improved as well as providing them with access to nature and water. It is important for planners and stakeholders to clearly communicate to residents the benefits of bringing water streams to the surface and restoring them . Benefits range from environmental to creating community spaces. Community participatory processes such as surveys and wayfinding installations are a great way of raising awareness and gaining support for daylighting projects. By engaging community residents and taking into account their ideas, stakeholders have been able to promote community stewardship that leads to support the restoration of City Creek in the Euclid neighborhood, reactivating a historically neglected area. I want to thank Westside Studio students Kate Steinicke, Kristina Haycock, Michael Dahlstrom, and Brian Garvey for organizing and documenting the community engagement event. Brian Tonetti, executive director of the Seven Canyons Trust, Colin Quinn-Hurst from the City’s Division of Transportation and Jade Sarver, founder of the Restore North Temple coalition, supported the student group in their efforts to raise awareness of City Creek and the upcoming Folsom Trail project. I also want to thank Alexander Barton who edited this article. Andel, Jelte van, and James Aronson. Restoration Ecology: The New Frontier. John Wiley & Sons, 2009. Bernhardt, Emily S., and Margaret A. Palmer. “Restoring Streams in an Urbanizing World.” Freshwater Biology 52, no. 4 (April 1, 2007): 738–51. Brun, Alexandre, Llewella Maléfant, Hervé Caltran, and Jérôme Albertin. “Recreating Nature in Cities: A Research Program for the River’s Renaturation in the Greater Lyon.” UPLanD - Journal of Urban Planning, Landscape & Environmental Design 2, no. 1 (April 29, 2017): 187–98. Cooter, William S. “Clean Water Act Assessment Processes in Relation to Changing U.S. Environmental Protection Agency Management Strategies.” Environmental Science & Technology 38, no. 20 (October 1, 2004): 5265–73. Elmore, A.J., and S.S. Kaushal. “Disappearing Headwaters: Patterns of Stream Burial due to Urbanization.” Frontiers in Ecology and the Environment, no. 6 (2008): 308–12. Freeman, M.C., C.M. Pringle, and C.R. Jackson. “Hydrologic Connectivity and the Contribution of Stream Headwaters to Ecological Integrity at Regional Scales.” Journal of the American Water Resources Association 43 (2007): 5–14. Lee, Yong-Ki, Choong-Ki Lee, Joowon Choi, Seol-Min Yoon, and Robert John Hart. “Tourism’s Role in Urban Regeneration: Examining the Impact of Environmental Cues on Emotion, Satisfaction, Loyalty, and Support for Seoul’s Revitalized Cheonggyecheon Stream District.” Journal of Sustainable Tourism 22, no. 5 (July 4, 2014): 726–49. Love, Ron. “Daylighting Salt Lake’s City Creek: An Urban River Unentombed Environmental Law Journal Symposium Edition: Outside Article.” Golden Gate University Law Review 35 (2005): 343–76. Moccia, F.D., and Sgobbo, A. (2013), “Flood hazard: Planning approach to risk mitigation”, WIT Transactions on The Built Environment, 134, pp. 89-99. Pinkham, R. “Daylighting: New Life for Buried Streams.” Old Snowmass, Colorado. : Rocky Mountain Institute, 2000. Pinkham, R., R. Serrano, E. Kwanza, and P. Krishna. “Three Rivers Second Nature Stream Restoration and Daylighting Report.” Carnegie Mellon. Pittsburgh, PA.: Studio for Creative Inquiry, 2001. Salt Lake City Government. “Euclid: Small Area Master Plan,” 2004. Salt Lake City Planning Division. “North Temple Boulevard.” Salt Lake City Planning Division, 2010. http://www.slcdocs.com/Planning/MasterPlansMaps/NTMP.pdf. Seven Canyons Trust. “Trust 100 Years of Daylighting.” Salt Lake City, UT: University of Utah, City + Metropolitan Planning Program, 2014. http://sevencanyonstrust.org/100-years-of-daylighting/. Sgobbo, A. (2016), “Recycling, waste management and urban vegetable gardens”, WIT Transactions on Ecology and The Environment, 202, pp. 61-72. Tira, M., Giannouli, I., Sgobbo, A., Brescia, C., Cervigni, C., Carollo, L., and Tourkolias, C. (2017), “INTENSSS PA: a systematic approach for INspiring Training ENergy-Spatial Socioeconomic Sustainability to Public Authorities”, UPLanD-Journal of Urban Planning, Landscape & environmental Design, 2(2), pp. 65-84. Walsh, Christopher J., Allison H. Roy, Jack W. Feminella, Peter D. Cottingham, Peter M. Groffman, and Raymond P. Morgan. “The Urban Stream Syndrome: Current Knowledge and the Search for a Cure.” Journal of the North American Benthological Society 24, no. 3 (September 1, 2005): 706–23.